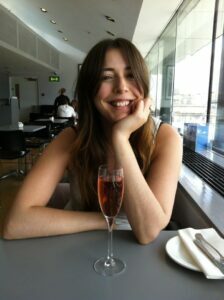 I’m Mallory, a director at an events agency and live with my boyfriend in South London. I enjoy making home-made pasta, and drinking red wine (as that’s good for your heart, right? ), while listening to some 80s music or counting down to Christmas. I was diagnosed with Wolffe-Parkinson-White (WPW) syndrome when in July 2012 I collapsed on a plane to the USA for a work trip. The first fact I discovered about the condition was that Meat Loaf was a fellow sufferer, and so I thought if the bat out of hell could beat it, so could I! I picked up a leaflet for CRY at my first cardiologist appointment and got in touch with them soon after. Following my electrical ablation procedure in November at St George’s Hospital in Tooting, and subsequent all clear in February 2013, I have contributed to the CRY newsletter, and the MyHeart booklet launched at Parliament in November 2013. I also recruited a team of friends for the London Bridges Walk in 2014 which was an amazing day. CRY were a huge support to me during my diagnosis and treatment of the condition, and I look forward to working with the team and supporting this very worthy cause over the next year.